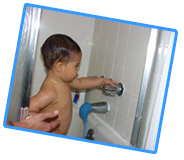 Children’s learning opportunities are “fixtures” in your bathroom! Beyond learning simply “to use the facilities,” young children find a home’s bathroom a great setting for all sorts of learning experiences. The presence of running water and fascinating “furnishings” guarantees interest and openness to all sorts of activities. Rub-a-dub-dub, the tub’s at the hub of learning opportunities in the bathroom. Washing hands can be good clean fun. Observe how bathroom plumbing works. This is the place to create bright smiles. Interesting discoveries abound at laundry time.